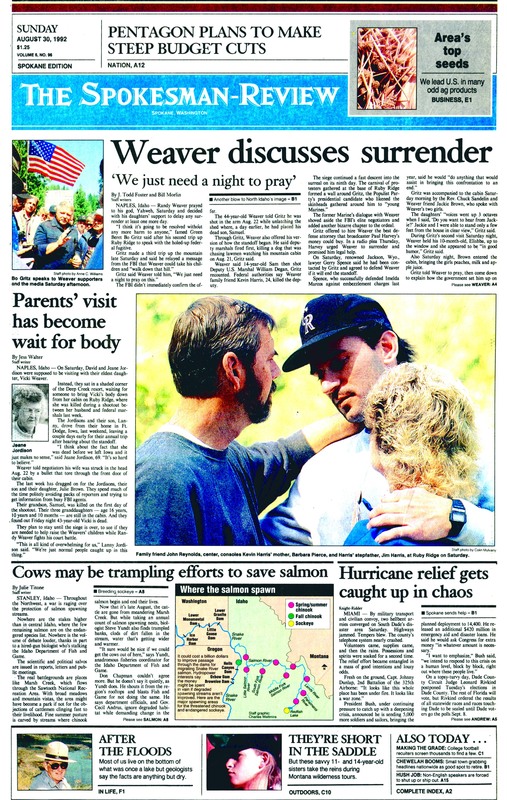 Sat., Aug. 29, 1992, 6:19 p.m.
NAPLES, Idaho – Randy Weaver prayed to his god, Yahweh, Saturday and decided with his daughters’ support to delay any surrender at least one more day. “I think it’s going to be resolved without any more harm to anyone,” famed Green Beret Bo Gritz said after his second trip up Ruby Ridge to speak with the holed-up federal fugitive. The FBI didn’t immediately confirm the offer. The 44-year-old Weaver told Gritz he was shot in the arm Aug. 22 while unlatching the shed where, a day earlier, he had placed his dead son, Samuel. Through Gritz, Weaver also offered his version of how the standoff began. He said deputy marshals fired first, killing a dog that was chasing lawmen watching his mountain cabin on Aug. 21, Gritz said. Weaver said 14-year-old Sam then shot Deputy U.S. Marshal William Degan, Gritz recounted. Federal authorities say Weaver family friend Kevin Harris, 24, killed the deputy. The former Marine’s dialogue with Weaver shoved aside the FBI’s elite negotiators and added another bizarre chapter to the ordeal. Gritz offered to hire Weaver the best defense attorney that broadcaster Paul Harvey’s money could buy. In a radio plea Thursday, Harvey urged Weaver to surrender and promised him legal help. On Saturday, renowned Jackson, Wyo., lawyer Gerry Spence said he had been contacted by Gritz and agreed to defend Weaver if it will end the standoff. Gritz was accompanied to the cabin Saturday morning by the Rev. Chuck Sandelin and Weaver friend Jackie Brown, who spoke with Weaver’s two girls. The daughters’ “voices went up 3 octaves when I said, ‘Do you want to hear from Jackie?’ Jackie and I were able to stand only a few feet from the house in clear view,” Gritz said. During Gritz’s second visit Saturday night, Weaver held his 10-month-old, Elishba, up to the window and she appeared to be “in good humor,” Gritz said. Also Saturday night, Brown entered the cabin, bringing the girls peaches, milk and apple juice. Gritz told Weaver to pray, then come down to explain how the government set him up on firearms charges. “I think they are still a little bit concerned about their personal safety,” Gritz said. About 200 agents surround the cabin, 40 miles south of the Canadian border. Harris is charged with murder in Degan’s death, and Weaver is charged with assault for firing a bullet that grazed another marshal. Harris said he would surrender Saturday if all charges against Weaver were dropped, Gritz said. On Friday, Gritz blamed authorities for the standoff and tried to make a citizen’s arrest of Idaho Gov. Cecil Andrus, FBI Director William Sessions, U.S. Marshal Service Director Henry Hudson and FBI chief Gene Glenn, the supervising agent here. Weaver offered grim details of how his wife was shot while holding their baby. “A bullet struck Vicki in the head, doing massive damage to her head and killing her instantly,” Gritz said. He related this chain of events of how the standoff began, Gritz said. Weaver, Harris and Sam Weaver startled deputy U.S. marshals watching the cabin, and their Labrador retriever charged the agents. After one of the deputy marshals killed the dog, Sam yelled, “You shot my dog” and then killed Degan with one shot to the heart with a 30.06 rifle, Gritz recounted. Another deputy marshal shot Sam in the arm. The boy yelled, “Let’s go home,” and turned and fled. He was killed with another round to the back, Gritz reported Weaver saying. The FBI has not disclosed whose bullet killed the teenager. Harris stooped over the boy, determined he was dead and met Weaver in the cabin, Gritz said. That night, the men and Vicki sneaked out and retrieved the body, cleaned it, wrapped it in a sheet and place it in a nearby shed where Vicki Weaver stayed during her menstruation period because of the family’s religious beliefs. The next day, Aug. 22, agents caught Weaver and Harris outside the cabin and opened fire, Gritz reported Weaver saying. One of those bullets killed Vicki and sent shrapnel and bone fragments into Harris’ arm and chest, Gritz said. A doctor, relaying questions through Gritz, determined that Harris likely has blood in one lung. Harris had trouble breathing and was coughing up blood, Gritz said. Harris has refused medical attention. “They’re using naturopathic means to take care of Kevin,” Gritz said. Harris spoke for the first time to people outside the cabin Saturday when he said, “Hallelujah,” to Gritz. “Tell my mom that I love her a lot. I’m OK. Yahweh is taking care of me,” Gritz said, quoting Harris. At one point during the negotiations, Weaver was spooked when Naples Baptist preacher Sandelin, who stood at Gritz’s side, made a funny sound to scare off a noisy chicken. Weaver, wanted for nearly two years for failing to appear in court on charges he sold two sawed-off shotguns, began speaking to Gritz Friday. The colorful presidential candidate had to convince federal agents he could talk Weaver down. Both Gritz and Weaver served in the Army Special Forces. The girls talked Weaver out of releasing their mother’s body Friday because their Sabbath is 6 p.m. Friday to 6 p.m. Saturday. “My daughters are not ready for that just now,” Gritz quoted Weaver as saying. Federal agents are pleased with Weaver’s negotiating tone and waited with relaxed patience, Gritz said. In his conversation with Gritz, Weaver vented much of his anger at the news media for what he said were ugly characterizations of his skinhead supporters and for other false information. Gritz (pronounced Grights) said the cabin has both a radio and a television. For example, Sam’s rifle was not placed next to the boy’s body in the shed, Weaver told Gritz. Weaver said he has the rifle. “He’s very concerned of the smearing of people he thinks are honorable, like his skinhead friends,” Gritz said. “They have been more help to us in keeping things under control than any other group or individual. “The skinheads are doing a great job, and he (Weaver) thinks they are being falsely labeled. I’ve learned to respect these people,” Gritz said. Gritz said he is trying to convince authorities to dignify Weaver’s surrender and let Gritz be handcuffed to the white separatist. FBI agent Glenn reportedly is reluctant to do that. During the Saturday morning visit, Brown took the family a baby bottle, a half-gallon jar of juice, grapes and a gallon of milk. The food was sent by the Deep Creek Resort a quarter mile away courtesy of owner Lorenz Caduff, who moved here recently from Switzerland. He stuck a Swiss flag on the box. Staff writers Kevin Keating, Susan Drumheller and Jess Walter contributed to this story. Published: Aug. 29, 1992, 6:19 p.m.